If your looking for a break from the chaos of Ho Chi Minh City, think about Mui Ne. Located just a five-hour drive from the big city, Mui Ne is a world away. Mui Ne is a favorite destination for many Saigonese and Russian travelers looking to get out into nature or enjoy the beach. Mui Ne is home to some breathtaking landscapes and unique scenery you won’t find anywhere else in Vietnam. Apart from that, it has an abundance of delicious, fresh, and cheap seafood. The White Sand Dunes just after sunrise. The sand dunes are Mui Ne’s most famous sight and one of the main reasons many visitors travel here. They are, after all, the only dunes of their kind in Vietnam! The White Sand Dunes are located 36 km east of Mui Ne tourist center. They are by far the largest of the two dunes, both in size and height, and extend for about 20 km along the coast. Due to their size, it is quite easy to find a spot to yourself to relax and take some nice people less photos in the white sand. Vendors rent atvs for you to drive around the dunes for 400,000 VND/18.18 USD for 20 minutes. The dunes are best visited in time to watch the sunrise or sunset. This is usually the first visit of the jeep tour. Girl sledding down the red sand dunes. Much like the White Sand Dunes, the Red Dunes are a very popular attraction in Mui Ne. They are located 11 km from Mui Ne tourist center and are much smaller in size than the White Sand Dunes. Even though they are smaller they are well worth a visit. Located right on the road and shorter in size, they are far easier to climb and experience. You can also get a view of the ocean from here. Since they are so small there are no atvs to rent here, but people will try to rent you a blue sheet of plastic to use as a sled. These cost 10,000 VND/0.45 USD for a few short slides down the dunes. There are also many vendors across the street from the dunes where you can buy some refreshments if you need them. This is usually the second visit of the jeep tour. When first hearing about the Fairy Stream I was apprehensive about it being a tourist trap or just disappointing (as all other ‘fairy’ named things I have been to have been), but this one was actually kinda nice. This small stream winds its way through the countryside with limestone formations and red sand dunes on one side and a bamboo forest on the other. For most of the way the stream is only ankle deep and has a sandy bottom, so you can wade through the water barefoot with ease. A short 20-minute walk upstream will bring you to a small waterfall and the end of your trip. This attraction can feel kinda touristy since the narrow stream simply funnels all of the tourist together. There is a 15,000 VND/0.68 USD entrance fee at the bridge, but if you are on a tour this is part of your tour cost. There are also a group of people under the bridge that will offer to store your shoes for you (for a price) so you don’t have to carry them, but it is not necessary to leave your shoes with them. This is usually the final visit of the jeep tour. Mui Ne harbor with the seafood market on the left. A visit to Mui Ne wouldn’t be complete without a visit to the harbor. Anytime of the day is great to see the hundreds of colorful fishing boats anchored in harbor, but late evening or early morning will really bring out the vibrance. There is a great overlook just northwest of town that will give you a great view of the harbor and seafood market along the beach. Early morning is also a great time to visit because the seafood market will be in full swing. The fisherman will just have brought their seafood onto the beach and will be sorting it into overflowing buckets, while their family sells them to restaurants, roadside stalls, and seafood vendors. You can’t visit a beach town without visiting its beaches. These may not be the best beaches in Vietnam and depending on the location may not be very appealing either. The beaches along the resorts are usually clean, but if you aren’t staying at the resort you will probably have a short stay before your run off by security. Suoi Nuoc Beach, east of Mui Ne, is also nice and secluded, but is pretty far from the touristy area. The rest of the beaches are really a gamble on whether they will be clean or not depending on the time of year. Since tourism is growing again in Mui Ne, locals have taken it upon themselves to try to keep the beaches clean. All of that being said, if you find you a spot the beach the views are nice. Empty seafood market at the Mui Ne harbor. Kite surfing is also something that is very popular in Mui Ne. This is especially true November through March, when the winds are perfect for the sport. The conditions here have made Mui Ne one of the top kite surfing locations in Southeast Asia and during peak season you can see hundreds of kites in the water at the same time. If you are up to try it out yourself, kite surfing instruction is available at $50/hour. Traveling by bus is the easiest way of traveling to and from Mui Ne. Whether you are leaving from Ho Chi Minh City or Nha Trang it will take about 5 hours. You have two bus options for this route, the public and open (hop on/off) bus. The public bus is the cheaper of the two and offers far more departure times since it leaves about every hour. Futa Bus is a good option and they have an office in the backpacking quarter of HCMC. A one-way ticket will cost you 130,000 VND/5.90 USD. These buses will drop you off outside your hotel. Leaving Mui Ne is just as easy going both ways, unless you are wanting to go to Dalat. The last bus to Dalat is at 1:30 pm. You can use 12Go to book your bus tickets online. The bus is another option for getting to Mui Ne, but it is not as straight forward and slightly more expensive. The train leaves multiple times throughout the day and arrives in Phan Thiet 3.5 hours later. A seat on the train varies in cost depending on the type of seat you want; ranging from $9 - $14. The train station is located northwest of Phan Thiet, so you will then need to either take a taxi or public bus to your hotel in Mui Ne. The red local bus goes from Phan Thiet train station to Mui Ne and cost 35,000 VND/1.59 USD. You can use 12Go to book your bus tickets online. You can rent a bicycle or motorcycle from many of the hotels and tour companies. The terrain is fairly flat and there isn’t a lot of traffic so a bicycle isn’t a bad option, but many of the attractions are further away than you might want to ride a bicycle to. You should also aware that if you rent a motorcycle you will likely be stopped by traffic police. Unlike most other places in Vietnam, the Mui Ne traffic police are strict about motorcycle licenses. International driving license work, but they will usually look to make sure that you have a motorcycle mentioned on the license. Jeep tours are the easiest and most popular option for getting around Mui Ne. Any of the tour companies can set up a jeep tour for you. The tour costs 220,000 VND/10 USD and covers the white and red sand dunes, fairy stream, and the harbor. They leave either at 5 am or 2:30 pm depending on if you would like to see the sunrise or sunset over the dunes. Our hotel in Mui Ne. The 10 km stretch of road is lined on both sides with hundreds of hotel options of all price ranges, so finding something for you will not be a problem. As you would expect, the higher end hotels and resorts line the most popular beaches, with the budget hotels and hostels lining the inland side of the road. If you are looking for a camping option, there is a campground with bungalows and tents on Suoi Nuoc Beach east of Mui Ne. If having a hotel on the beach is important to you, then some research will need to be done before booking. Due to the migrating sands, many of the "beach side" resorts are actually against a sloping cement wall that leads into the sea. Many of the mid-high end hotels also have pools. 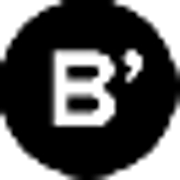 I recommend using Agoda to find the best hotel for you. Try using the Agoda widget below to book your hotel stay in Mui Ne. Seafood hotpot before all of the ingredients were added together. 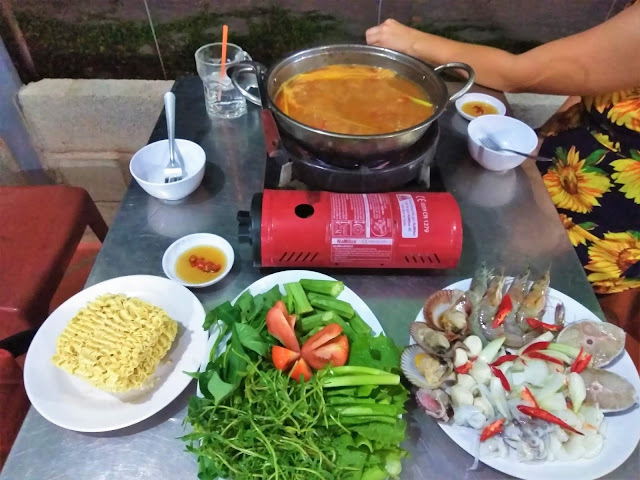 It isn’t hard to find food anywhere in Mui Ne and when it comes to Mui Ne’s specialty it is all about the seafood. If seafood isn’t your thing there is no need to worry, you will easily be able to find a whole array of western food here as well. Mui Ne was once a favorite spot for Russian tourist, so don’t be surprised when many of the menus are in Russian. 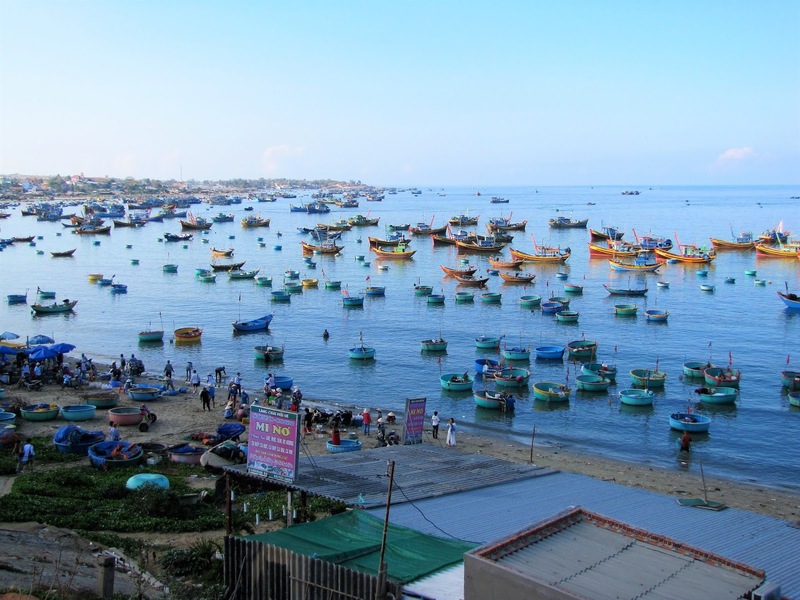 Before the tourist boom, Mui Ne was just a small fishing village and it has stuck to its roots. Here you can find all sorts of seafood and for incredibly low prices. I recommend trying the seafood hotpot, a dish you can find throughout Vietnam, but you won’t find it cheaper than here in Mui Ne. 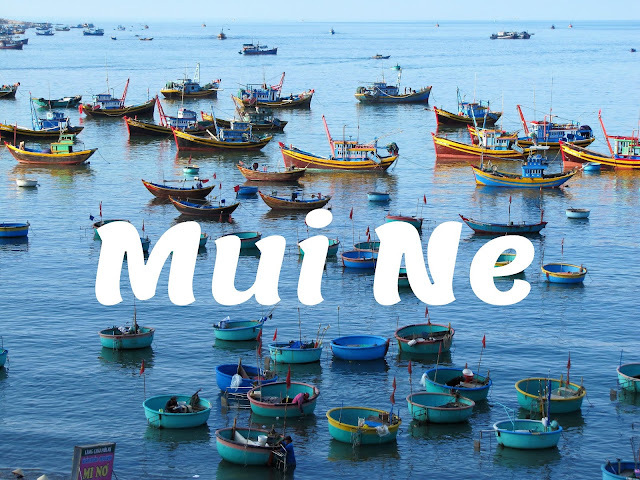 What did you like best about your stay in Mui Ne?